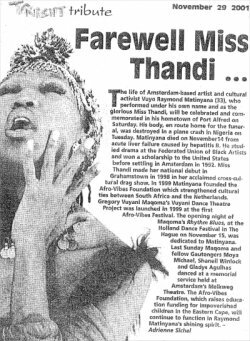 The life of Amsterdam-based artist and cultural activist Vuyo Raymond Matinyana (33), who performed under his own name and as the glorious Miss Thandi, will be celebrated and commemorated in his hometown of Port Alfred on Saturday. His body, en route home for the funeral, was destroyed in a plane crash in Nigeria on Tuesday. Matinyana died on November 14 from acute liver failure caused by hepatitis B. He studied drama at Federated Union of black Artists and won a scholarship to the United States before settling in Amsterdam in 1992. Miss Thandi made the national debute in Grahamstown in 1998 in her acclaimed cross-culture drag show. In 1999 Matinyana founded the Afro-Vibes Foundation which strengthened cultural ties between South Africa and the Netherlands. Gregory Vuyani Maqoma's Vuyani Dance Theatre Project was launched in 1999 at the first Afrp-Vibes Festival. The opning night of Maqoma's Rhythm Blues, at the Holland Dance Festival in The Hague on November 15, was dedicated to Matinyana. Last Sunday Maqoma and fellow Gautengers Moya Michael, Shanel Winlock and Gladys Agulhas danced at the memorial service held at Amsterdam's Melkweg Theatre. The Afro-Vibes Foundation, which raises education funding for impoverished children in the Eastern Cape, will continue to function in Raymond Matinyana's shining spirit.